Much will be written in coming days about the just-concluded trilogy bout between Manny Pacquiao and Juan Manuel Marquez in which Pacquiao escaped with a split decision, prompting Marquez and his trainer Nacho Berestain to once again claim they’ve been robbed. Having just conducted an exhausting review of the first two fights (see PM1 Analysis and PM2 Analysis), I would agree that in the prior fights there was room for them to make such a case because, in large part, the punchstats in those fights favored Marquez. He led Pacquiao in overall punches and power punches in both fights. I actually had Pacquaio winning PM1 by 1 point, and losing PM2 by 1 point. So I’m not coming from a place of partisan blindness. But here’s the thing — I’ve been looking at the stats for the just concluded PM3, which no one has had a chance to digest yet, and comparing them to PM1 and PM2. These stats don’ t lie, and they favor Manny Pacquiao, decisively. 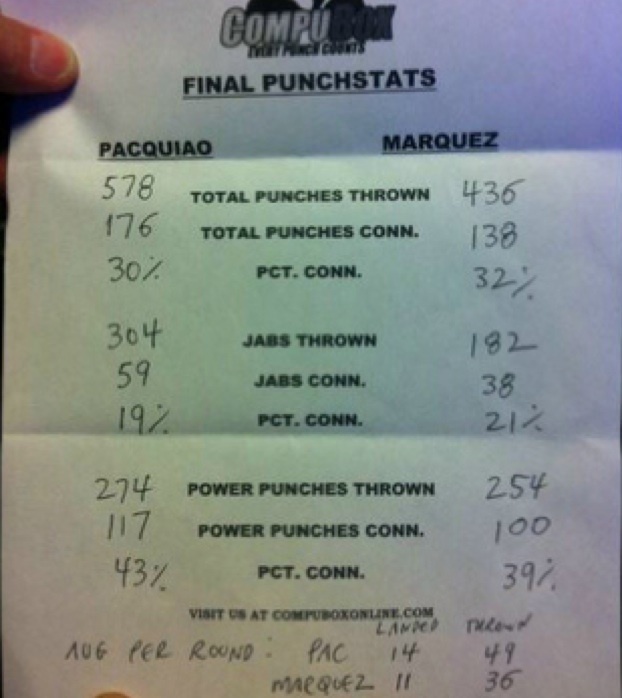 Compubox punchstats are not everything–there are times when outcomes don’t track with them. But that’s rare, and the realizty is that in the absence of knockdowns, punchstats generally correlate over 97% with scoring, meaning 97% of the time the judges and compubox are in agreement in any round where there is no knockdown. In any given round, the fighter who lands more punches, (particularly when he also land more power punches in addition to overall punches) almost always win the round. Folks, I would submit that these stats tell the tale. Previously Pacquiao had to rely on his knockdowns to offset his disadvantage in punchstats. Indeed, prior to the fight tonight HBO made a big point of pointing out that Maquez had won 57% of the rounds to date on the judges’ scorecards which is consistent with his punchstat advantage. Minus the knockdowns, he wins at least one of the fights, and possibly two. But here’s the catch: if Marquez wants to rely on punchstats to claim he won the first fight, then he must live by punchstats and acknowledge this time it was different — this time the stats are against him and he lost a close fight fair and square. Pacquiao outpunched Marquez in PMIII and did not have to rely on knockdowns to demonstrate his superiority. Marquez claim that he was robbed is meritless. Berestain, Hall of Fame Trainer that he is, was a fool tonight…..
Knowing what had happened in the first two fights when going to judge’s scorecards, and knowing (as he should have) that his fighter was lagging behind in punch differential and powershot differential after having led in those categories previously — how could he be telling his boxer coming down the stretch “You’re winning”, inviting him to coast all the way home? That was pure tomfoolery. Pacquiao is the champ and, as Emmanuel Steward put it, you have to take the crown from the champ. You must win decisively. For Berestain to tell Marquez he was winning was criminally negligent. If Marquez had approached the championship rounds with the kind of urgency they demanded, he might have won. At last, Manny Pacquiao looks human. “Dinomita” Marquez is “Kryptonita” to Pacquiao. By looking less than overwhelming against an opponent that Mayweather had handled in superior fashion to Manny, it may be that Pacquiao has finally made the only move that could get him a date with Mayweather. Maybe Mayweather will now at last feel he can beat Pacquiao — that’s what has been holding him back. If he feels that, now is the time for the fight to be made. May 5, 2012 — my prediction is it will happen and the closeness of this fight is a direct contributing factor. Was this a satisfying victory for Pacquiao or his fans?